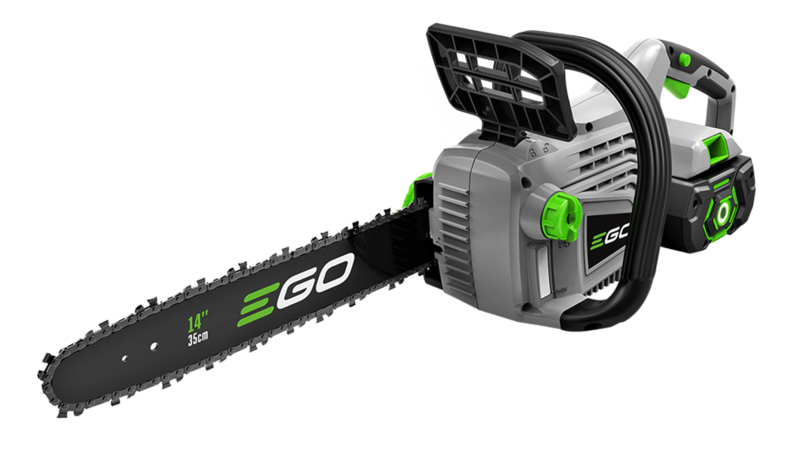 The EGO POWER+ Chain Saw truly delivers Power Beyond Belief™. The 14" bar and chain, combined with a high-efficiency brushless motor, provides effortlessly smooth cuts. The EGO POWER+ Chain Saw truly delivers Power Beyond Belief™. The 14" bar and chain, combined with a high-efficiency brushless motor, provides effortlessly smooth cuts. The brushless motor extends both the life of the tool and the run time. Compatible with all EGO POWER+ ARC Lithium™ batteries (available separately) to deliver Power Beyond Belief™. Guide Bar Length: 14 in. Maximum Cut Diameter: 14 in. 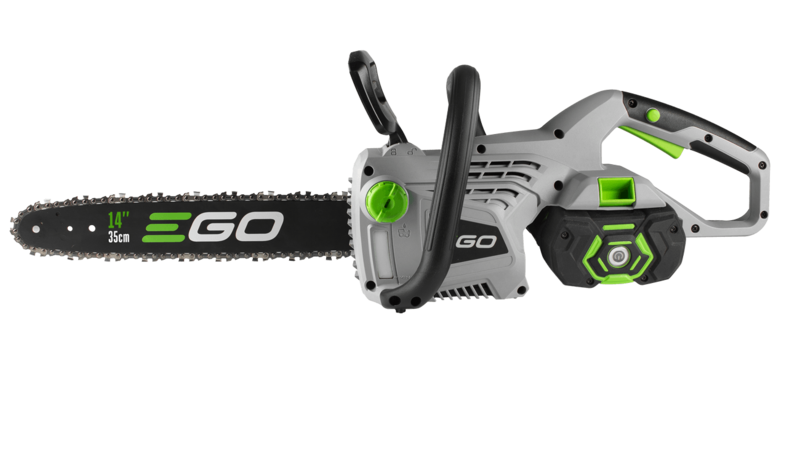 The EGO 16" Chain Saw truly delivers Power Beyond Belief™. The 16" bar and chain provide effortlessly smooth cuts. The brushless motor extends both the life of the tool and the run time. I bought my EGO...just in time for hurricane Irma to come through. It handled the cleanup very nicely. Plus, I took down a few additional trees in the yard. I have never owned a chainsaw before. But I have used a gas-powered one. Much prefer using the battery-operated one. Felt much safer using it. This chainsaw is amazing!! I think it is perfect, not only for those that have little to no familiarity with chainsaws, but also for those that have much more experience. It is easy to use, light, and relatively quiet. Are the 14” and 16” bars interchangeable on either chainsaw? Can I sharpen the chain without replacing it? Yes, please check the owner’s manual for specific instructions. How can I adjust a loose chain? Adjusting a loose chain is easy with our tool-less chain-tensioning knob. Further instructions can be found in the owner’s manual. Do I have to buy bar and chain oil for this tool? Yes, these chainsaws do not come with bar and chain oil included in the package or tool. Please fill the oil tank with bar and chain oil prior to the first use. Which replacement chain is suggested? You can use either EGO chain (model AC1400) or an OREGON® chain (model:90PX052X).